Mark Long joined Rich & Cartmill, Inc. as a sales associate in March 1997. He moved his business from a local insurance agency where he worked as a producer. Prior to that, he was a marketing representative for Federated Insurance. Mark became a Shareholder in the agency in 2002. Mark obtained a Bachelor of Science degree in Engineering Technology with a minor in Construction Management from Oklahoma State University. He has worked in the construction industry both in contracting and sales roles prior to entering the insurance business. 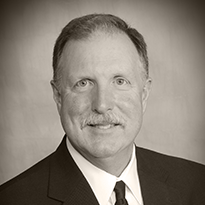 A native Oklahoman, Mark has served as President of the Independent Insurance Agents Association of Greater Tulsa and as a member of Board of Directors of the Independent Insurance Agents Association of Oklahoma along with many associations and has achieved the CPCU and the CIC professional designations. Along with his family, Mark attends St. Bernard’s Catholic Church. He is an avid hunter and fisherman, and enjoys golf and music.